Camping, being one of the coolest outdoor activities, needs planning beforehand and is the best when it comes to bonding with friends, family or loved ones. You might have your grandma by your side in the camp, telling horror stories and sharing their best experiences. 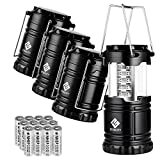 This is when you require a good yet long-lasting camping lanterns that can keep the camp enlightened through the night. 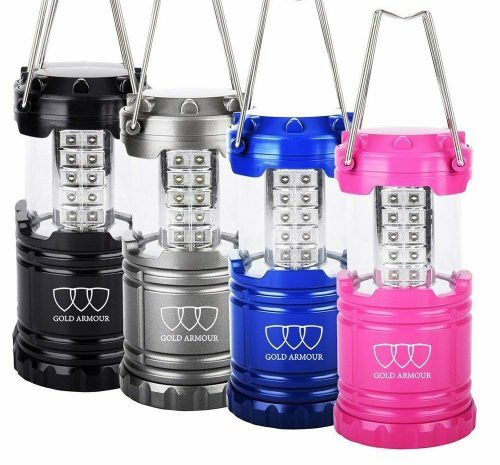 In this guide, we have determined the 10 best camping lanterns that you might choose one from, depending on your needs and budget. It’s never been easier to bring a vintage feel to an outdoor party. But this Lantern brings the vintage feel. 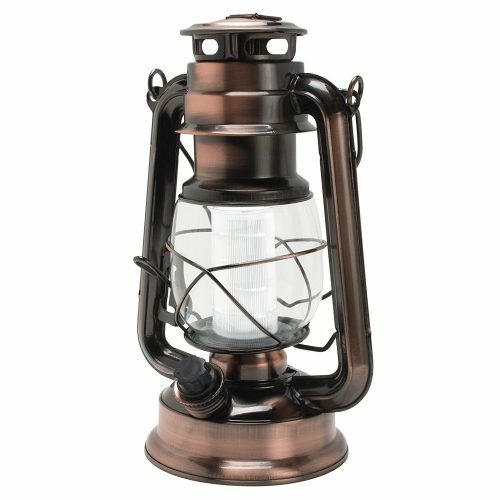 The vintage lantern from Northpoint features a retro-style handle, a light output of 150 Lumen and 12 High-Quality LED. The lantern has a Dimmer Knob to control the amount of light output so that the lantern can be used as a nightlight or origin of light for a dark path. 12 LED’s delivering the Light output of 150 Lumen. Coleman manufactures some of the best selling camping items. This Coleman Twin LED lantern produces a maximum of 390 extra-bright lumens making it extremely powerful. It features two powerful, Cree-Xlamp XR-E LED bulbs. The lantern runs on battery, a set of eight D-cell batteries, that provides light up to 150 hours on low and 15 hours on high setting. The lantern’s durability makes it weather resistant making it ideal for outdoor use. Long-lasting, cool-running Cree Xlamp LED Bulb. 32-ft beam distance on high and 19-ft beam distance in low. Are you tired of bulky, dim, lack of battery efficient lanterns? Gold Armour LED lantern features 30 super bright, individual low powered LED bulbs, illuminating light in 360 degrees with 135 lumens. The lanterns are hand-built with CE & ROHS approved military grade ABS material making them extra durable. 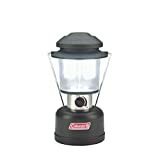 The lantern can be utilized for both indoor and outdoor activities. 360 Degree Light output, 135 Lumens. Up to 12 hours of regular and continuous use with full battery capacity. Water resistance and collapsing brightness control. 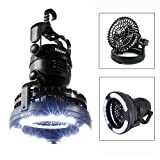 This resourceful lantern has 18 bright LED lenses, and the lighting angle is adjustable to 360 degrees. Addition to providing light, this lantern comes with a fan to provide cool breeze with a flick of a switch varying from low to high. 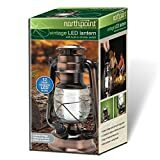 The portable LED Camping Lantern with ceiling fan runs on one D battery that can provide 20 hours of light, 5 hours of the fan in high-speed mode and 15 hours in low-speed mode. 18 bright LED Lights outputting in 360 degrees. A two-speed fan to provide a cool breeze. The Streamlight Siege is rugged, cordless and compact lantern featuring C4 LED technology, with five output modes. The lantern has a battery indicator built into the on/off button and it provides two light outputs, red and white. It features a night vision preserving mode along with the bright white light which extends the lanterns’ run time. The D-rings in the lantern can be stowed out of the way when not in use. Provides 360-Degrees of soft, even light illuminating a Large area. Rubber molded base provides stability and it is RoHS compliant. 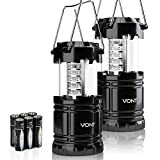 Vont camping lantern will surprise you the moment it is unboxed and switched on. The lantern offers 360 degree of super bright light that comes from 30 individual LED bulbs. 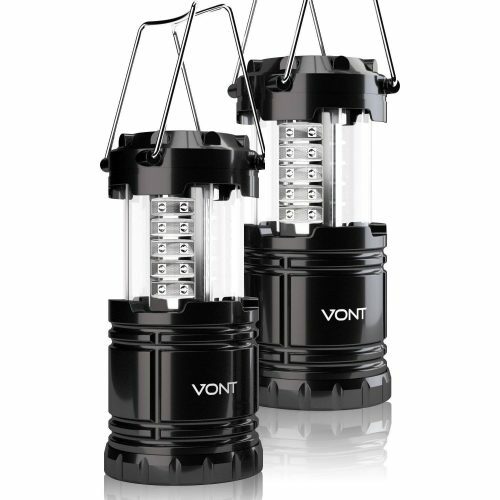 The Vont Lantern is smartly constructed which allows the brightness level to be adjusted by collapsing and decollapsing it. Low power, long-lasting LEDs provide bright and power illumination without draining complete battery power. Lightweight and compact, military-grade construction, water resistance. Provides 20,000 hours of light before it becomes obsolete. 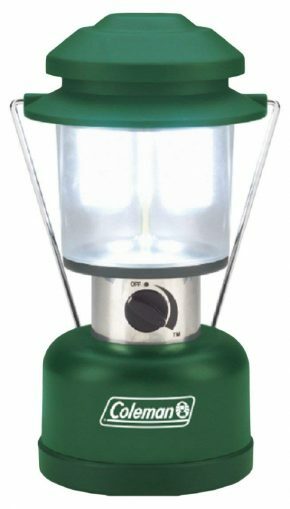 Designed with a view to providing safety, this super bright lantern provides light, clarity, with an output of over 600 lumens with the help of LED bulbs. 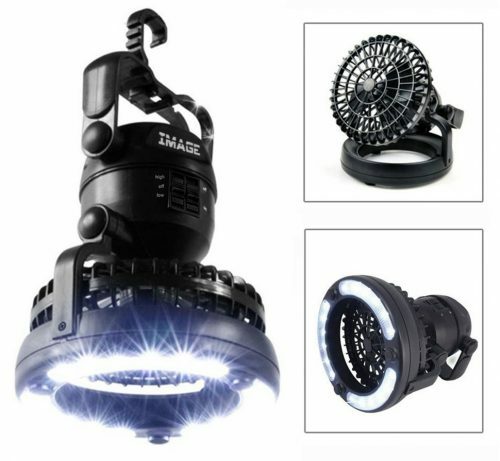 It comprises 3 lighting modes; these are low, high and flashing strobe. 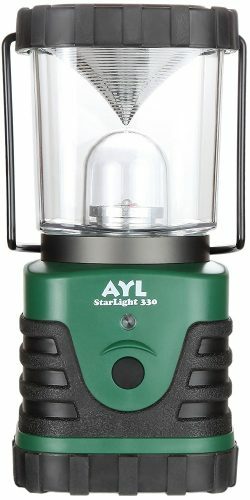 The AYL Starlight comes with a removable convex reflector cap, thus providing 360 degrees of light. To virtually set it anywhere, a hook is provided at the bottom. The output of over 600 lumens and over 100,000 hours of use. 3D batteries offering 6 days of power in a single charge. Lightweight, Shockproof and water resistant. The Brightest LED Lantern is developed using latest Chip-On-Board LED technology emitting 350 lumens of light. The use of high-quality materials in its development makes it long lasting and more durable. The lantern is extremely lightweight build allowing it to be carried easily. Chip-On-Board LED Technology thus illuminating 350 Lumens of light. Advanced Collapsible Design and water-resistant. Up to 10 hours of regular, continuous use. This is another camping lantern by Etekcity which is not only lightweight and compact but also ultra bright. Powered with 30 LED bulbs, this lantern provides ultra bright light and ensuring a longer lifespan. The lanterns’ brightness can be controlled by collapsing it. 30 Individual low powered LED bulbs illuminating 360 degrees luminous light. Increased durability and water resistant. 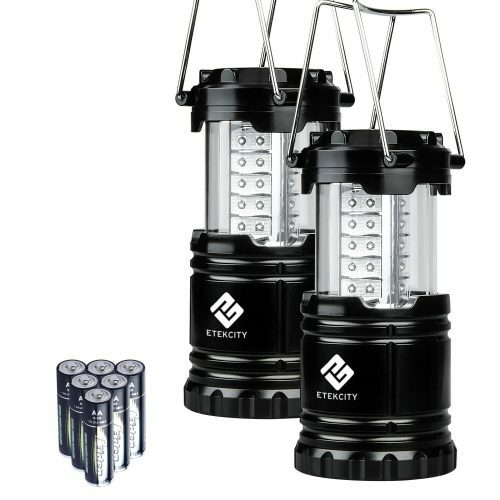 Etekcity Camping LED collapsible Lanterns are lighter, brighter and portable, providing up to 12 hours of bright light spreading in all directions. While saving energy, the Etekcity LED lantern flashlights save energy making it more durable and long-lasting. With its simple design and practicality, this lantern makes it ease of use for outdoor camping. The fold-out collapsible handle makes it portable. Lightweight, compact and AA battery for low consumption. Quality build, long lasting, increased durability. 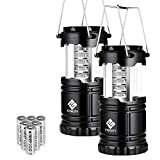 Before you take a plunge into buying a camping lantern, you must consider factors such as the number of batteries, battery type, weight, extra features, among others. Since these electronic lights are susceptible to damage during rain or storm, it’s will be ideal to buy one that is durable, waterproof and rugged. Every lantern’s purpose is to emit light, however, you need to determine which lantern makes the most sense for you.